We’re more than halfway through the 2018 Denver Parade of Homes, and are excited to announce the winner of the second week of its #MyParadeInspiration social contest. Ferguson Bath, Kitchen and Lighting Gallery, Samsung and Fireplace Warehouse ETC are each sponsoring one of the three weeks during which the contest will take place. The first week was sponsored by Ferguson Bath, Kitchen and Lighting Gallery. 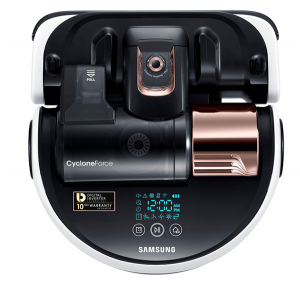 One (1) POWERbot R9250 by Samsung. The POWERbot R9250 makes cleaning carpet and hardwood a breeze, featuring Wi-Fi connectivity, Visionary Mapping™ and FullView™ Sensor for the best cleaning path. Congrats to @jmdenverhomes for winning this week! Submit an entry and next week you could be the winner! Next week’s winner will be announced live on the Parade of Homes’ Facebook page on Wednesday, Aug. 29, 2018. Take a photo and show us what inspires you from anywhere in any of the 75 participating Parade homes and post it on Facebook, Instagram or Twitter. Tag Parade of Homes Denver, the weekly sponsor and the Home Builder with #MyParadeInspiration. Pay attention to the Parade of Homes’ social media accounts throughout the Parade. One lucky winner will receive a prize each week, starting on Wednesday, Aug. 15, 2018, with the last winner announced on Wednesday, Aug. 29, 2018. The #MyParadeInspiration social contest coincides with the 2018 Denver Parade of Homes, which runs from Thursday, Aug. 9, 2018 through Sunday, Aug 26, 2018. During this time, the Parade is being held on Thursdays, Fridays, Saturdays and Sundays from 11 a.m. – 6 p.m.